I love animals. It’s ridiculous how much. Enough to spend a lot of money to feed sloths at a wildlife conservation center. Yes, sloths. Let’s face it: sloths aren’t the most lovable animals. Most people seem to think they’re gross. 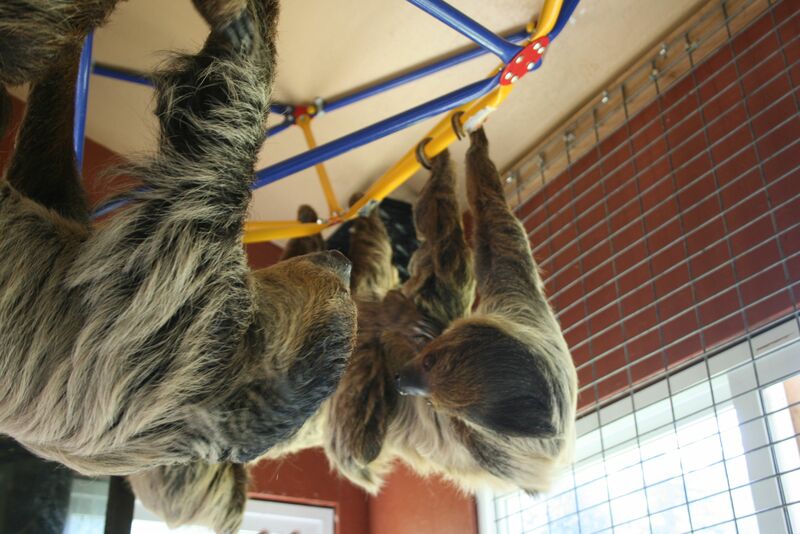 Thankfully, these sloths didn’t have moths or moss on their backs. They were friendly, cute and moved so slowly and carefully, it felt like being surrounded by a group of lovable geriatrics. I half expected one to start telling me a story from the old days. Why don’t sloths play the wise old one in cartoons more often? Typically, I’m against animals in a for-entertainment setting (see my kangaroo farm post). 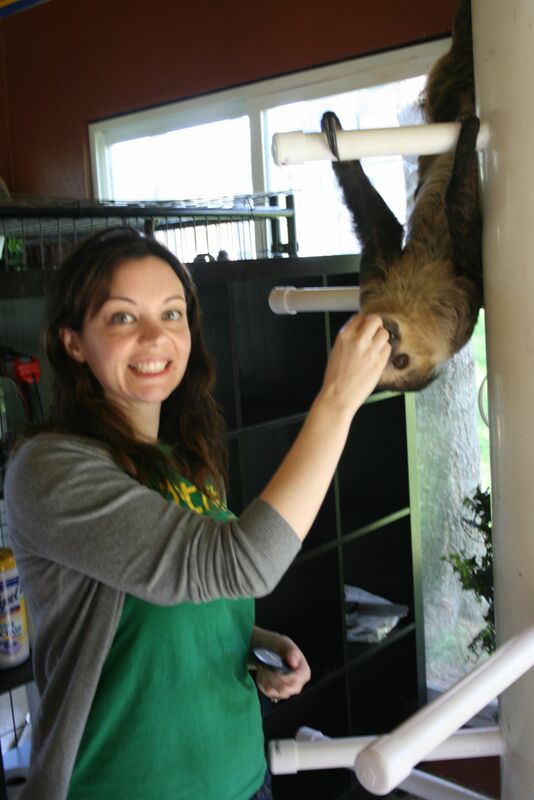 But the sloth center is a research and education center and only allows small groups to visit a select few of their animals ambassadors. The animals aren’t asked to perform; there’s no glass to bang on and no parade of tourists. Most of the animals are never seen by humans. You can feed wolves, walk exotic cats, play with lemurs. Sloths pee and poop out the same hole. 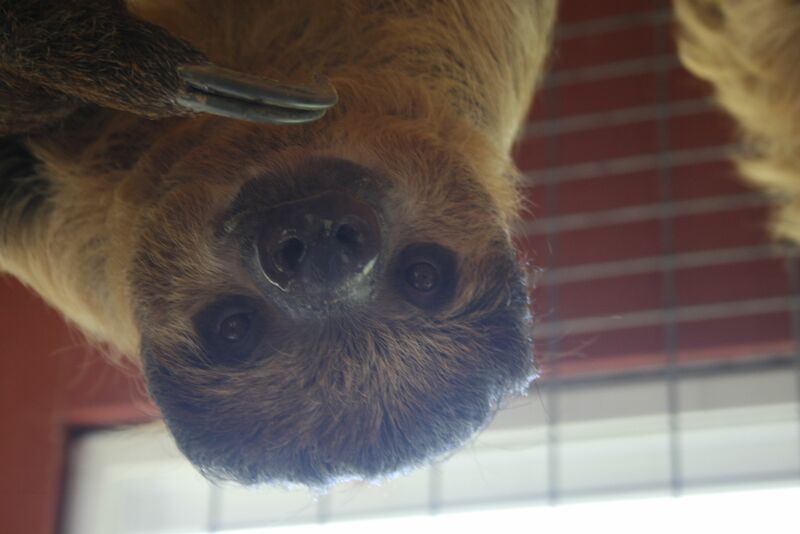 Sloths come down from their trees every three days. 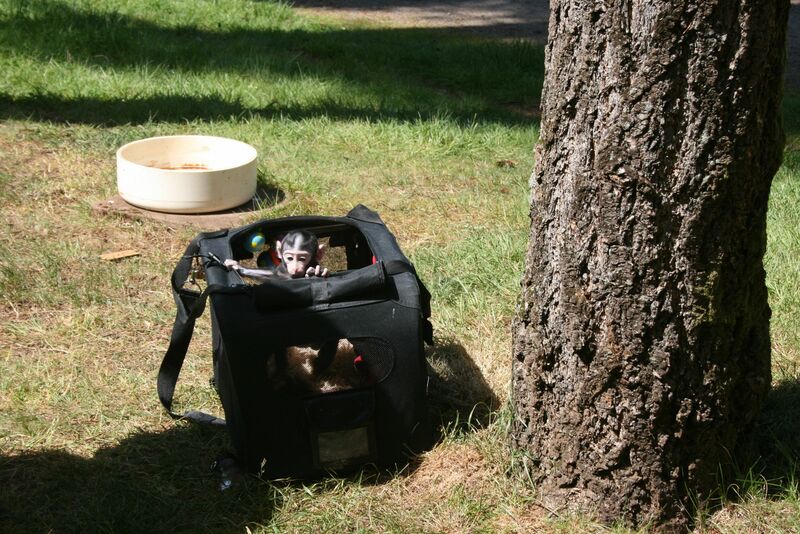 Categories: PhotoNarratives | Tags: animals, oregon, photography, sloths, travel | Permalink. I passed through Detroit a couple times, once during a raucous road trip I took to Niagara as a teenager, two other times when driving to/from Quebec City. Each time, we zipped passed, the skyscrapers tall and strong against a gray winter sky. This time, I got to experience the city for real, visiting close friends who left Seattle for Detroit. (There’s a giant hole in my heart now and I fill it with reruns of The Office and glasses of cabaret). I wanted to walk inside blighted buildings, snap trees winding around staircases. I wanted to capture misfortune, the ruins of a cultural hub. Peeling wallpaper. Graffitti. Empty museums. People in big coats bracing against the bitter cold. But that’s one story of Detroit. It’s not the whole story. Detroit denizens remind me a bit of kids I grew up with in Chicago: Tough. Prideful. All survivors of something. Also, friendly. I snapped photos of empty, dark mansions that line the streets like abandoned doll houses. I tried to capture the sun filtering through punctured glass of factory windows. I took a photo of a calico stalking prey in a vacant lot. But there’s fresh paint on Comerica. There’s the jack-hammer buzz of construction. There’s Greek Town and Midtown and they look just like every hip town in America. There’s brunch in the haunted Whitney Mansion—an impossible experience in Seattle. Our brunch places are overcrowded and definitely don’t include bottomless mimosas. In the Detroit Public Library, there’s a whole floor dedicated to illustrated car manuals. Not something I’d ever read, but I loved the vintage car posters on the walls and the ornate details. I charmed my way inside the Detroit Opera House. I buzzed the door and walked to the box office, fully expecting to get the boot. A guy wearing a hard hat asked what I was doing. I said I just wanted to take a few photos. That’s it. No mention of this blog or my mediocre rise to travel writer stardom or any press of any kind. He let me in and gave me a behind-the-scenes tour. When I opened the door to the stage, I actually gasped in awe. Hundreds of lush velvet chairs await for the derrieres of fur-clad opera-goers. Intricate suns curve up the dome ceiling. The balcony made me nostalgic for something I never experienced. I don’t know enough to comment on the city’s financial health or whether it will turn around. All I know is that I spent a lovely few days in the city and I saw a glimmer of possibility. Sometimes to find the beauty of a place, you just have to change your angle. Categories: PhotoNarratives | Tags: America, Detroit, photography, rancid, travel | Permalink. I went traveling, a journey through the Southwest. I left with the feeling that I could settle down in an old adobe under New Mexico’s powder-blue skies. Sante Fe – maybe Albuquerque, land of Breaking Bad and also as I discovered, a difficult city to spell. We went to the Spirit of the Winds balloon fiesta and took the completely justified 1,000 pictures of hot air balloons (you’ll see those soon). We zipped north into Santa Fe, than Taos, then Colorado, honey-gold aspens winding through thick evergreen forest like a strand of garland. We stayed at the Inn of the Turquoise Bear a historic B+ B in Santa Fe, formerly owned by the poet Witter Bynner and rented to his artist friends. Georgia O’Keefe. Ansel Adams. Carl Sandberg. I could write a whole post about that place and the food. Oh wow, the food. I shopped South Congress in Austin, saw an armadillo in Houston. But the Taos Pueblo stands out because it was one of those unexpected things you find in travel. The Taos Pueblo is one of the oldest continuously lived-in residences in the US and one of the most private and secretive of the pueblo communities. I didn’t even have it on my itinerary at first because we only had one night in Taos and I wasn’t sure about the timing or what I really wanted to see in the town. Touring the Pueblo is $16 per person. There are guided tours if you have the time to take one (which I sadly did not). I read the list of rules thoroughly. Don’t take pictures of tribal members without their permission. Don’t swim in the river. Don’t let your kids run amuck. Don’t take smiley selfies near sacred grave sites. I felt icky. Like I should not be there, but that I should see it. Like I should whisper, even though the day buzzed with construction activity. Camera-strapped tourists darted in and out of the shops and residences of the tribal members. Their language (Tiwa) is unwritten and there’s an expansive wilderness area behind the pueblo off-limits to non-tribal members. Running water and electricity are prohibited in the pueblo. There’s a bell-tower from the original San Geronimo church, built in the 1600s when the tribe was forced into Catholicism by Spanish missionaries. That church was destroyed by US troops in the late 1800s (after the murder of Governor Bent) and many people died in the battle, so they turned it into a cemetery. But they built another church – its walls are smooth, a sandy color and topped by white crosses. The architecture of the church is extraordinary, but you still get the sense that the church doesn’t really belong. I would rather my tourist dollars go to corn necklaces and fry bread made here, than those high-end shops that peddle overpriced turquoise rings. And I think interactions and access help dilute preconceived notions. But I cannot imagine what I would feel like if a bunch of tourists traipsed through my apartment to gawk at me. Categories: Facts of Life | Tags: adobe, culture, new mexico, photography, travel, waylon jennings | Permalink. Is That a Sunset Or An Oil Painting Made By Angels? Another round-up of Tuesday Three Things That Happened Last Week. This is my sister’s chihuahau with a stuffed toy in it’s mouth & it makes me laugh so hard. After a few months of freelancing, I have a new job. A dream job if you will. Freelance writing drove me a little too deep into my own head and working in pjs was fun until I woke up and realized I hadn’t worn actual clothes in a week. Also, sporadic paychecks from writing gigs don’t really *work* anymore in Seattle, with our sky-high rents. I’m a writer/editor for a cool company that helps bands and shows with ticketing and promotions. The coolest thing about it that it embodies a Come As You Are mentality, so I could probably get a forehead tattoo and they wouldn’t blink an eye. I’m working for the man in a creative capacity without actually working for The Man. Perfect. And this is a company that REALLY gives back to the community, so that makes me feel good, especially after my whole age-33-meaning-of-life crisis. I’m not bragging, I want other dream-followers to stick it out and find the job they really want. I get a week off to volunteer and am already fantasizing about volunteer opportunities. -Volunteer to find out what happened to Lindsey Lohan? -Work the cafeteria of some fancy writer’s conference? (Hey, Toni Morrison, I slipped you a copy of my latest. Hope you like these mashed potatoes). I’m already enjoying perks like conversations with actual humans in the middle of the day, office dogs, and air conditioning. Bon voyage! (These are strangers, not my actual friends). This is a bummer: I had to say goodbye to some really good friends of mine because they left our glorious state for another. I am super happy for them because I know that moving long distances (thrice!) has made me a better, happier person because it’s incredibly frustrating and also fun. It takes a lot for me to make friends (I’m a giant weirdo), especially here where the social scene is a maze of passive-aggressive invitations to happy hours followed by passive-aggressive refusals. THIS low-res iphone photo does not do justice to the amazing sunset on Sunday. Everyone and their brother is moving to Seattle and judging by Saturday’s packed summer fest, my neighborhood is the quartier du jour. It both pisses me off (I WAS HERE FIRST!! SECOND) and amuses me. I’d never leave Chicago. You know it rains there, every day right? And they don’t even have a basketball team. And the suicide risk is high. You might as well move straight into a mental hospital because those clouds are gonna drive you nuts. [Drops bags off, looks out window] OMG this place is amazing! Is that a sunset or is that God’s hand coming down to personally bless this place because it is the most.beautiful. in the whole world? Proof it’s not a fluke: last year’s winning sunset starring a rainbow ribbon cloud. Even with my awesome new job, I cannot afford rent that’s much higher than its current $1,600 a month for 700 sq.ft and I’m terrified I’m living in the next San Francisco. And with all the new condos/traffic/pedestrians darting into the street, my neighborhood feels a little less like MY neighborhood. I’ve lived here on and off since I first moved to the city, when it was uncool amongst my hip writerly coworkers who (then) lived on The Hill and thought White Center was too dangerous and West Seattle too suburban. I live on a peninsula and get to hang out at the beach pretty much every day so, I’ve been pretty happy. Does wanting to join an anti-development coalition make me old? Categories: Stupid-funny lists | Tags: Friendship, iphone photography, jobs, photography, seattle, sunsets, west seattle | Permalink. Thank god it’s not statutes. Am I right? Ha, ha. You’ve probably seen this one before because I am so proud of it. 1. I don’t use auto settings anymore. 2. I’ve become kind of annoying to my friends. 3. I will post more photos on here. Statues are so easy to photograph because they stand there and look pretty and don’t even get mad when you take a selfie with them. Statutes are noticeably more difficult. Where’sMyBackpack, thank you for such a great travel challenge. Categories: PhotoNarratives | Tags: art, challenges, louvre, Paris, photography, travel theme | Permalink.